Toronto's Premier Wynne has sent out Energy Minister Chiarelli to sing to the masses on the debt retirement charge burdening Ontario's electricity bills. Profits that exceed those considered a fair return to the shareholder (the Province) for it's equity in OPG (all of it), were also to pay down the stranded debt. And yet you still have a stranded debt charge applied to your hydro bill. Now, regardless of how ridiculous the claim is following the last ridiculous claim, the Wynne government is looking at a line item charge (charges are BAD) on electricity bills, introduced by a Progressive Conservative government,(see what charges are) and telling us it should probably stay on the bill. Compassionately, they are looking at a line item credit on the bill (credits are GOOD), the Ontario Clean Energy Benefit (OCEB) introduced by a Liberal government (see what credits are), and thinking maybe it should stay on there. Hydro customers pay an amount toward that stranded debt with every bill. Chiarelli said retiring that debt is taking a little longer than originally anticipated. “The financial projections turned out not to be as precise as they were anticipated,” he said. The ministry is now looking at options to ensure that when the OCEB comes off the bill, residential customers don’t face additional costs, he said. At least until after another election, I'm sure it's useful to partisan Liberals to have a Conservative charge on the bill, amounting to 0.7 cents/kWh, and a Liberal credit, amounting to twice that amount (or more), but the existence of the debt retirement charge (DRC) has nothing to do with the existence of the OCEB. Heck, the existence of the DRC has nothing to do with the debt levels either. The Ontario Electricity Financial Corporation (OEFC) is the entity that was tasked with handling the debt of the former Ontario Hydro. In the final full fiscal year before the McGuinty Liberals replaced the Eves Conservatives in power, the OEFC reported debt of $26.8 billion. The most recent accounting shows the OEFC's debt at $26.9 billion (Table 5.5 of 2013 Ontario Budget) . It does not look like Liberal governments have attempted to pay down any debt. The big picture is more muddled than this, with different types of debt with different revenue sources meant to address one debt pocket or another. The original care in structuring the debt seems rather nonsensical in hindsight: since 2003 Liberal governments have not reduced debt, the market share of the public generator (OPG) has shrunk as it's assets aged, and the market has contracted (demand is down). Whatever debt there now is must be more vulnerable that that which existed a decade ago. What the government has done is spend recklessly. OPG's Niagara Tunnel project was financed through the OEFC. It began construction not long after Dwight Duncan's "hybrid" system was introduced, which set low regulated rates for OPG's large hydroelectric assets to offset the much higher rates the government intended to contract from private-sector suppliers, with the expectation this, "would keep the overall blended price for electricity relatively stable.” Over the next seven years OPG's hydroelectric output would be remain at essentially a frozen, very low, regulated rate as the rates charged to consumers soared, while OPG was forced to finance $1.5 billion in spending on the Niagara tunnel project. Only 1 cent/kWh more on OPG's regulated hydro, during construction of the tunnel, would have avoided any loan, Parker Gallant advises that the cost of the financing will instead be, "about $96 million annually ...for the next 50 years (amortization period), which equates to $4.6 billion." The debt incurred during the Niagara Tunnel project benefited OPG's private producer competitors as OPG's regulated rates hit the cost impacts of the new supply; now the debt will benefit financiers for some years to come. There is no indication it helped ratepayers. Perhaps the most clear signal that this government has no intention of paying down electricity sector debt, or provide electricity sector value for consumers, is not coming from the difficult generation side of the business, but from the profitable distribution side's Hydro One. The legal Lexology site provided an exceptional article from Ian A. Mondrow last week dealing with what appears to be an unfolding spending spree; The future of Ontario's electricity distribution sector: renewal or disappearance? ...Hydro One has agreed to pay a sizeable premium over net book value to win the bidding process instituted by Norfolk’s owners. There were other bidders, but it is hard for others to compete with the Hydro One borrowing clout that comes from the backing of the provincial balance sheet. 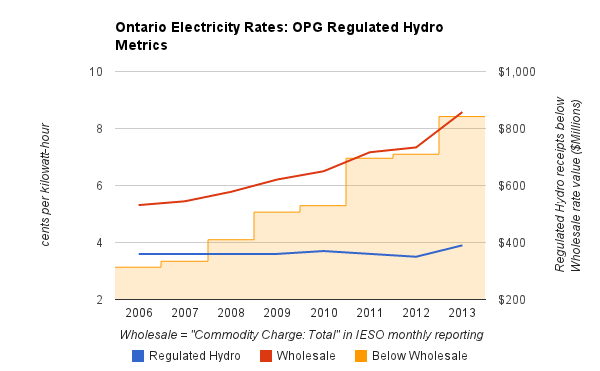 ... Hydro One borrows to finance all of its significant investments. ...What is not clear is why the Ontario government, tacitly or otherwise, is endorsing Hydro One’s aggressive approach to local distributor acquisition. It can only increase Hydro One’ already large debt load, and is squeezing out potential acquirers that may be lower cost operators. Debt is great - it allows a Progressive Conservative charge of 7/10ths of a cent per kilowatt-hour to remain on every ratepayer's every electricity bill. Minister Chiarelli, having blessed another round of excessive spending by Hydro One, now spins that each ratepayer will see that Conservative charge continue because the debt just isn't going down as hoped. There's just no way to stop collecting it. To compensate the compassionate Wynne government will continue to show, on ratepayers' bills, their OCEB credit of 10%, or roughly 1.7 cent per kilowatt-hour. Hopefully it is not also politically effective. The inability to finance a project during construction isn't uncommon. In Ontario, it strikes me as an artifact from the days of public electricity supply "at cost"; Ontario Hydro was not allowed to make a profit, so it could hardly reinvest profits in new projects. Neither can its successors - which is, given what was to be a competitive market, a policy probably long past it's "best before" date. Most of the financing thus far the Lower Mattagami project is not from the OEFC, although there is an agreement to draw on funds from the OEFC - to be unfair, loans are at higher rates than the OEFC would have provided.